With only six matches on the card, the WWE had a difficult task of entertaining tonight. With no defense of the Intercontinental and Tag Team titles and little promo and developments, this pay per view will go down as one of the most disappointing Survivor Series’ ever. The matches were ultimately lackluster and none delivered in the way an event like this should. Sadly, aside from CM Punk’s entertaining win over Alberto Del Rio for the WWE Title, Beth Phoenix’s Top Rope Glam Slam, Big Show’s Elbow Drop from the top and a surprise appearance from Howard Finkel, as CM Punk’s ring announcer, there wasn’t much to smile about. Overall, the Madison Square Garden crowd was energized and ready for something special to go down. The first two matches were okay, but the Divas match set the tone and got the crowd involved the way they weren’t after the Dolph Ziggler/John Morrison encounter. Right after that, The Rock cut a promo that continued to get the fans going. For a guy that has been on TV only a handful of times over the past eight years, The Rock is more over than anyone in the company now. The fact that the mark Henry/Big Show match ended the way it did proves the WWE has no idea what they are doing with their World Title. After this pay per view, there’s a larger question in need of being asked though: Does the creative team behind this project understand what their fans want anymore? United States Champion Dolph Ziggler vs. John Morrison: An opening match that was flooded with “We Want [Zack] Ryder” chants throughout. The actual in- ring action was mediocre, in spite of a nice neckbreaker by Ziggler [while Morrision was on his way back into the ring] and some assorted high-flying by Morrison. Once they started countering each other and the near-falls came in succession, the match got better. The finish was nice, as Morrison’s Starship Pain was countered and Ziggler hit the Zig Zag soon after for the win. Overall, the Ryder chants were the coolest part of the contest. The match itself looked far too choreographed. After the match, Ryder hit the ring and Ziggler was the victim of the Rough Ryder leg lariat. WWE Divas Champion Beth Phoenix vs. Eve Torrez in a Lumber Jill Match: Like the opening encounter, this match dragged as well, but both Torrez and Phoenix worked very hard. There was a nice combination of submission and grappling, but the finish was what made the match a special one. Delivering her Glam Slam finisher from the top rope for the win, Phoenix stole the show with the move of the night. Survivor Series Matchup: Team Barrett: Wade Barrett, Dolph Ziggler, Jack Swagger, Hunico and Cody Rhodes vs. Team Orton: Randy Orton, Sheamus, Kofi Kingston, Sin Cara and Mason Ryan: Orton beat Ziggler with an RKO early on, but the heels got lucky as Sin Cara apparently hurt his knee and was eliminated from the match. Rhodes made the most of that momentum and beat Ryan with the CrossRhodes a few minutes later, which earned him the fans respect. Sheamus wasn’t the victim Ryan was however. After minutes of toying with the Intercontinental Champion, Barrett and Hunico had to play their parts to even up the contest. They did just that, as Sheamus tagged in Kingston, who was soon eliminated by Barrett. A few minutes later, Sheamus was eliminated for kneeing Swagger repeatedly and refusing to stop. Luckily for Orton, he was able to cover to Swagger for the pin and make it a three against one contest. Orton soon caught Hunico with a high-angle RKO and eliminated him, leaving just Rhodes and Barrett. But the combination of Rhodes and Barrett was too much. After he hit Rhodes with another RKO, he walked into the Wasteland from Barrett, which led to a Team Barrett win. World Heavyweight Champion Mark Henry vs. The Big Show: These two spent entirely too much time feeling each other out. The “boring” chants told the story. While things got better after Show kicked out of Henry’s front body slam finisher and a splash, the damage was already done. At that point, this match was a disaster. Show took a surprising amount of punishment though and his top rope elbow was insane and made the match memorable. Soon after, Henry kicked show in the gonads and got himself disqualified. After all of that work to save the match, it ended up as a joke. WWE Champion Alberto Del Rio vs. CM Punk: This wasn’t an epic, but it did save the PPV. Howard Finkel’s announcing of CM Punk got the crowd energized again, but this match didn’t deliver until the final few minutes. For the first ten minutes of the match, there was a total lack of high impact offense, aside from a few big bumps to the outside and top rope splashes from Del Rio. Punk took over the last half of the match though, hitting Del Rio with a neckbreaker, a bulldog and several chops and kicks. Soon after, Del Rio hit a backcracker and the match finally had some real conflict. Throughout most of the contest, it felt as if they were trying too hard. Echoing the Macho Man Randy Savage, Punk hit Del Rio with a top rope elbow and the match continued to gain momentum. After that, the counters came fast and furiously, before Punk caught Del Rio in the Anaconda Vice for the submission win. 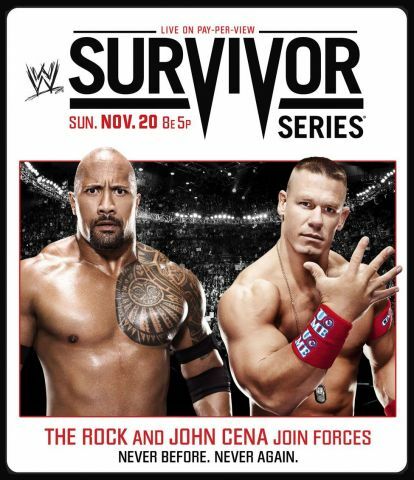 The Rock and John Cena vs. The Miz and R-Truth: the crowd was waiting for this moment the entire night. The Rock delivered early on, showing his signature athletic ability. If there were any doubt before tonight, they have been silenced. He still has it. Once Cena was tagged in, the match took a different route, as he went through his usual routine, but found time to make fun of The Rock in the process. This gave Truth an opportunity to attack Cena and get his team back in the match. The Rock simply watched Truth and The Miz work on Cena and fans knew it was only a matter of time until the Rock came in and got the win. At the same time, they knew he wasn’t eager to help Cena. Getting hit with all of The Miz’s and R-Truth’s setup offense, Cena took a beating. It was enjoyable to see Cena sell this much in a match and it built a nice tension in the match. With the Tag Team as poor as it is now, this was great tag match and proof that The Miz and R-Truth are technically sound and entertaining. After Miz and Truth hit The Rock while he was on the apron, he eagerly changed his tune and wanted to get into the match. Once he did, he went through his assortment of offensive maneuvers on The Miz, including the Rock Bottom, a dragonscrew leg whip and sharpshooter. R-truth then got involved and gave his partner some more time, but a few second later, The Rock hit the people’s elbow for the win. After the match, The Rock called Cena into the ring and after a few minutes of meandering, the People’s champ hit Cena with the Rock Bottom. A pretty basic ending to what was supposed to be a huge moment leading to Wrestlemania. While this match proves The Rock can still go, it still had moments of pure drag. The ring agents have to do a better job of speeding up the matches and eliminating the filler. It’s understandable that there has to be some posturing, but tonight was mostly eggs and not enough ham.